Intention, Ownership, Consumer, Tools, Translate. These were the five bullets of thought that Friends of Dance guest artist and instructor Jennifer Green Flint covered in her discussion on choreography this past Sunday afternoon. The Friends of Dance had the pleasure of joining 15 current UMW dance students for a wonderful choreography workshop with the former MWC dance scholar. Jennifer graduated in 1995 with one of the last B.A. 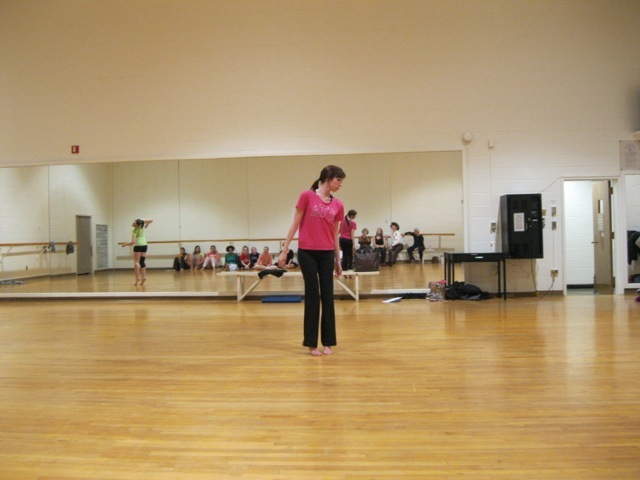 Dance degrees from Mary Washington College and currently works at Shenandoah University after receiving an M.A. Arts Administration from SU, and is currently working on her PhD at the school. The Friends of Dance spoke with her after our 20th Anniversary of Dance Scholarships celebration in November, and are thankful that she was able to come and host a workshop with current Performing Arts Club (PAC) choreographers! The workshop began with a short introduction of each dancer's names, majors, and prospective graduation years before jumping into guidance of how to articulate choreographic choices and interpretations. While her usual time frame for the choreography material is one full semester, she managed to lead discussion on key concepts, teach a 30 second phrase of movement, allow 10 minutes for each dancer to manipulate the phrase, followed by a few presentations of manipulated phrases, and leave 15 minutes for questions on her career and life as a dancer and arts administrator. The two hour workshop offered the current Performing Arts Club (PAC) students vital information about how to process, understand, and execute choreography for the upcoming dance concert on March 29th and 30th. With one-on-one instruction and guidance in addition to leading group discussions, she embedded a creative curiosity in the students that most will continue to use in future artistic endeavors beyond this semester's upcoming dance concert. Most of the present student choreographers were seniors and preparing for graduation, but the discussion of "who owns this choreography?" and "why bother?" will enter into the common dance dialogue of the student run club. The ideas and benefits of the workshop will undoubtedly surpass the ears of the attendees and will extend to the larger club for semesters to come. The Friends of Dance at the University of Mary Washington provide scholarships for current dance students and encourage dance in the Fredericksburg and UMW communities.